Founded in 1799, The Dartmouth is America’s oldest college newspaper. Since its beginnings in the 18th century, the newspaper has undergone numerous changes. The name has changed three times, from The Dartmouth Gazette to The Daily Dartmouth to its current version, The Dartmouth. We have printed issues with varying page counts and sizes, modified the sections of the paper and altered the geographic scope of coverage. Beginning today, March 25, The Dartmouth will once again change. Our paper will transition from an 11-by-14 inch tabloid format to the new dimensions of 11.375-by-11 inches. This modification comes as The Dartmouth relocates its printing press operations to Upper Valley Press, after our previous printing facility operated by Valley News in West Lebanon closed. Valley News has moved its printing operations to an offset printing facility in Penacook, NH owned by its parent company. 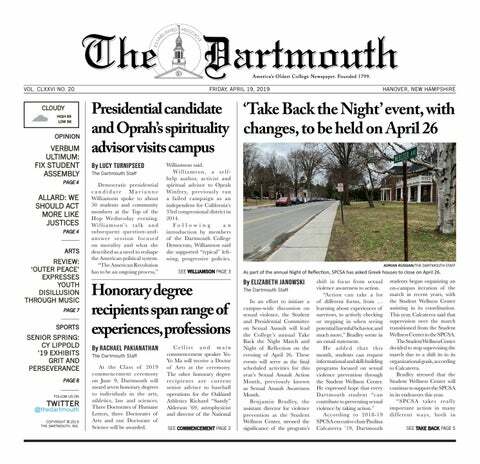 As the broader newspaper industry evolves, we too will continue to evolve to ensure The Dartmouth meets the needs of its readers and provides high-quality, trustworthy, independent news and information to the Dartmouth community. Two hundred twenty years after its founding, America’s oldest college newspaper is optimistic about the road ahead. We have always taken pride in our dedicated base of readers and recognize the importance of maintaining a close connection with the community we serve. To that end, we invite and welcome your feedback moving forward. Please do not hesitate to reach out to us at editor@thedartmouth.com or publisher@thedartmouth.com. Correction appended (March 26, 2019): This article has been updated to clarify that Valley News' printing press facility in West Lebanon has closed, not that Valley News has closed.